Summary KUBO AND THE TWO STRINGS is an animated fantasy about a gifted boy who embarks on a magical quest, accompanied by a maternal monkey and a samurai beetle. 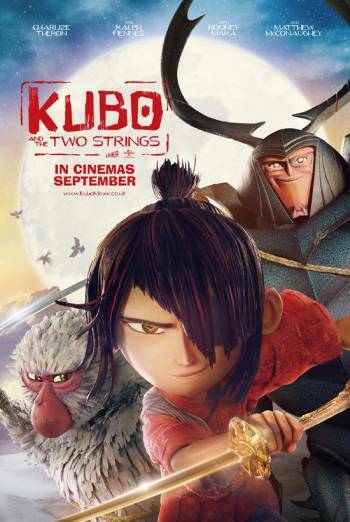 KUBO AND THE TWO STRINGS is an animated fantasy about a gifted boy who goes on a magical quest, accompanied by a maternal monkey and a samurai beetle. Characters fight against fantastical creatures with swords and other weapons. One character is injured during combat and a wound is briefly seen. There are some scary scenes, set in spooky locations, featuring witches, a giant skeleton and various other monsters. The main character is a young boy who has lost an eye at the hands of his monstrous grandfather, who is intent on taking the other. There is therefore a sense of mild threat throughout. The theme of grieving and loss features heavily throughout.